Sochi, Russia (CNN) -- The Olympic city has a dog problem. Thousands of stray canines wander the streets and suburbs of Sochi. They can be seen loping through the recently completed parks and housing developments that have sprung up around what was once a sleepy Black Sea resort. In the countdown to the Winter Games, Russian animal rights activists have accused city authorities of ramping up a campaign to exterminate street dogs through the use of poison. Yulia Krasova says she witnessed the long, agonizing death of a street dog when she walked out of a movie theater in Sochi two weeks ago. "At first I thought someone beat the dog," she recalled. "The dog jumped up and started running around in circles. Then she fell down and started spitting up ... I called the veterinarian. He said there is a 100% guarantee the dog was poisoned." 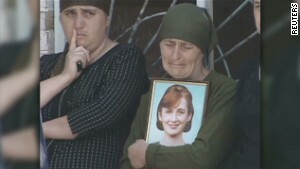 Krasova filmed the dying dog with her cell phone. So did Irina Gutnik, another Sochi resident. Gutnik said she encountered a dog convulsing and barking in fear and pain in Sochi's Bitka neighborhood in December. "They always poison the street dogs here," Krasova said. "But in December it got terrible ... they began poisoning the animals terribly before the Olympics." Reports of the widespread culling of animals have put city and Olympic officials on the defensive. "All stray dogs that are found on the Olympic Park are collected by a professional veterinary contractor for the well-being of the people on the Park and the animals themselves," the Sochi 2014 Organizing Committee said in a statement this week. "All healthy animals are released following their health check." Vladimir Makarenko, the head of the administration for Sochi's Hostinski district, said volunteers were welcome to take stray dogs to a brand new shelter recently opened on the outskirts of the city. But the announcement of new government-backed shelter was met with deep distrust by members of the grassroots network of animal rights activists in Sochi. "Over the last couple of days, when this uproar began, they built this new shelter just for the media," said Vlada Provotorova, a dentist who built her own make-shift shelter to protect dogs from extermination. Animal rights activists in Sochi sent CNN photos of three recent contracts signed between the Sochi city government and Basia Services, a company headquartered in Rostov-on-Don. In one of the documents, dated May 24, 2013, the city government agreed to pay the company 99,450 rubles [roughly $2,800] for the "trapping and gathering of neglected animals." CNN made several attempts to speak by phone with executives at Basia Services. Company representatives declined to respond to allegations their employees poisoned street animals. As alarm grows among Russian dog lovers, some animal rights activists have taken matters into their own hands. Last month, one Muscovite, Igor Airapetyan, drove all the way to Sochi to pick up a van-load of street dogs that he then "evacuated" to the Russian capital. Video of the journey trip was posted on a Facebook page titled "Death in Sochi." Meanwhile, Provotorova and several friends continue to donate time and money to feed, house and sterilize the dozen street dogs they placed in a small kennel they built on the outskirts of Sochi. This week, the dogs barked and wagged their tails madly when Provotorova and several other volunteers arrived with fresh supplies of dog food. "We are protecting them from Basia," said Provotorova said. 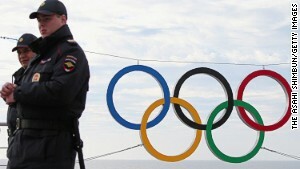 "I don't blame the Olympics," said Dina Filippova, as she scrubbed out the kennels with a mop. "We don't have a sterilization program, so there is a huge amount of stray dogs here and authorities try to control them. They can't." Filippova, a lawyer living in Sochi, argued Russia needs new legislation for the protection and management of animals. "In Russia, you can abuse animals and it's not a crime. You can buy and adopt an animal and release it on the street, it's not a crime," she said. "You have no legal obligation to sterilize your dog or cat." Filippova and Provotorova both conceded that their families often accused them of being "crazy" about animals. But one of their fellow volunteers had another explanation for why she devoted so much time to caring and feeding for homeless animals. "At my age I prefer taking care of animals," said Valentina Slivat, who described herself as a "simple Soviet nurse" who worked at a hospital in Sochi. A fluffy street dog named "Pushistik" followed Slivat constantly around the kennel, and periodically leaped into her arms. "People have hands, legs, brains. But animals have been abandoned. We need to save them," the nurse said. CNN's Gena Somra contributed to this report. Toothpaste bombs on Russia flights? The U.S. advised airlines to be aware of explosive materials hidden in toothpaste tubes on flights to Russia. U.S. officials say they have 'specific' reasons to worry about security in Sochi. In their tall, fur hats and embellished traditional jackets, hundreds of Cossacks are patrolling the streets of Sochi, Russia. The Black Sea resort of Sochi, the site of the 2014 Winter Olympics, is in south-east Russia, an area that borders several volatile regions. In their tall, fur hats and embellished traditional jackets, hundreds of Cossacks are patrolling the streets of Sochi as the games approach. American athletes are being warned not to wear their Olympic uniforms outside of the upcoming Winter Games in Sochi. Tracey Madigan was looking forward to watching hockey at the Olympics with her three kids. Now, she's scrambling to cancel their plane tickets. Olympic officials discounted an e-mailed threat to the upcoming Winter Games, but the reported warning raised new concerns about security at the events. Wanted posters of a terrorism suspect on the loose, warships at the ready and a video threat from beyond the grave. Police killed a suspected militant leader in a shootout in Russia's restive republic of Dagestan amid increasing security concerns. Sochi 2014: Do the numbers add up? The Winter Olympics is a matter of days away but whether you are using an abacus or calculator the numbers just don't add up. Erin Burnett talks to Fmr. CIA Counter-Terrorism officer Jeffrey Beatty about security concerns at Sochi. 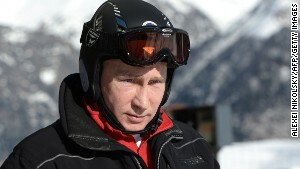 Russia's Vladimir Putin again sought to downplay fears that gay visitors will be discriminated against.